Nicola Sturgeon has been accused of snubbing the Queen’s birthday. This was not because Scotland’s First Minister declined an invitation to a Palace knees-up – though Her Majesty must ache to have Nicola’s sunny disposition light up her party – but because the Scottish Government has decreed that the Union Flag is no longer to be flown from public buildings on royal birthdays and anniversaries. A January 2018 update to ‘Flag Flying Guidance’ instructs that the red, white and blue will now fly from government buildings only on Remembrance Day, whereas the previous rules had allowed for up to 15 occasions throughout the year. Ostensibly it is a startling change, one which Liam Fox, himself a Scot, condemned as ‘small-minded and typical of the narrow vision of Nationalists’. The new official instruction to civic Scotland is that in addition to there being a permanent Saltire – the national flag, but which the SNP often appropriates as a narrow political ensign – royal events will now be commemorated by flying the Lion Rampant. This flag has historically been much more popular with Scottish sports crowds, especially at international football matches, than the St Andrew’s Cross; although the Lion Rampant is the Royal Standard, its informal use in Scotland has therefore long been associated with recreational nationalism. With Theresa May also said to have urged the reinstatement of the Union Flag, Nicola Sturgeon retorted with what she described as a ‘Memo to the PM’s new “fake news” unit’. Labelled by Conservative MSP Murdo Fraser as ‘Trump-style Twitter denial by candlelight’, a series of tweets issued by the First Minister denied that she had given any such instruction; indeed, Sturgeon claims to have expressed no opinion on the matter, though it seems safe to assume that the less she sees of the emblem of Unionism, the happier Nicola will be. 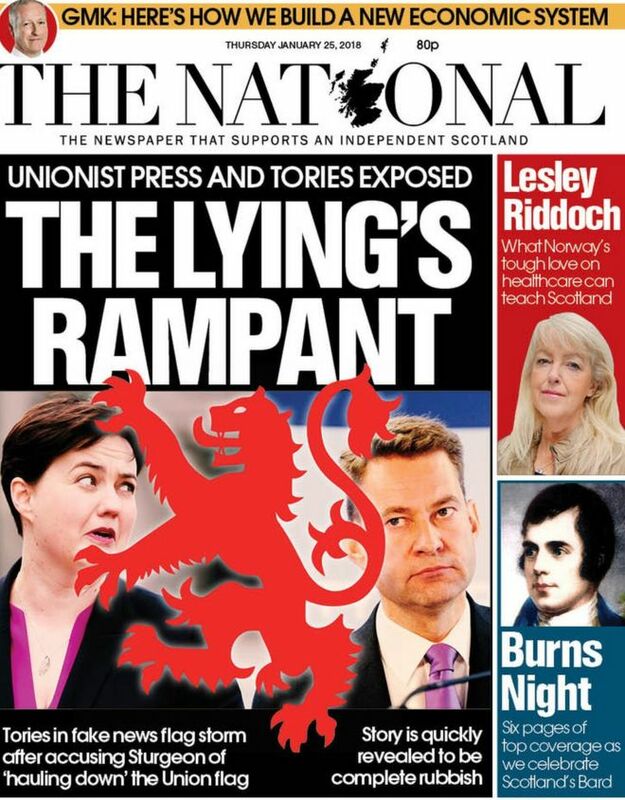 To claims that the SNP is seeking to ‘eradicate’ the Union Flag, The National – the self-styled newspaper ‘that supports an independent Scotland’ – reacted with ‘The lying’s rampant’; which, to give credit, was a smart headline. Sturgeon’s predecessor Alex Salmond also came to her aid: ‘Eck’ announced that it was he who had altered the flag policy in 2010 following consultation with the Queen, and that the new guidelines are simply administrative confirmation of existing practice. This is factually correct, and it prompted the Daily Mail to publish an apology for having wrongly fingered Nicola Sturgeon. Nevertheless, it is difficult to imagine Her Majesty being the one who instigated such change rather than it having been a SNP initiative to mothball the Union Flag from 2010. And while we are accustomed to the Civil Service moving slowly, eight years for the Protocol and Honours Team to update its policy formally is not even glacial pace. Let me guess the reason for such sloth: because government bureaucracy has suffered ‘savage’ Tory cuts? Regardless of the Nationalists’ spin, it is undeniable that since taking office in 2007 SNP policy has been to make the Union Flag less visible in Scotland. 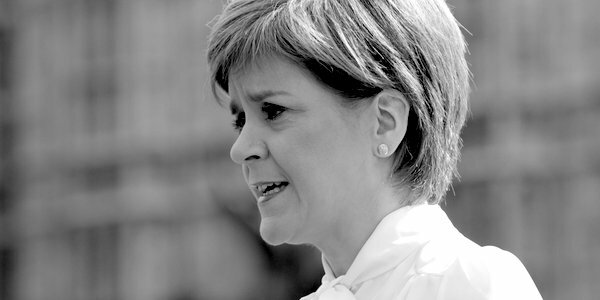 Despite this recently being framed as insulting Her Majesty, the SNP’s attitude is less to do with antipathy towards the Queen – while much of its support is rabidly republican, the Nats’ official position is still for an independent Scotland to retain the monarchy – rather, it is typical Nationalist nose-thumbing towards Westminster and Downing Street. In addition to Remembrance Day, maybe those who voted against independence should lobby for the raising of the Union Flag every September 18. Mind you, with the Nats still smarting at having lost that referendum, and given the SNP’s uncritical devotion to the European Union, perhaps we UK-loyalists should be grateful that the flag of Britain’s union still has parity with the unspeakable twelve yellow stars, hoist each year to mark Europe Day on May 9 (sadly, not to commemorate June 23, 2016). And whereas the flag of the United Kingdom now has only one scheduled annual appearance, the Rainbow Flag is officially sanctioned to be flown a remarkable four times each year. 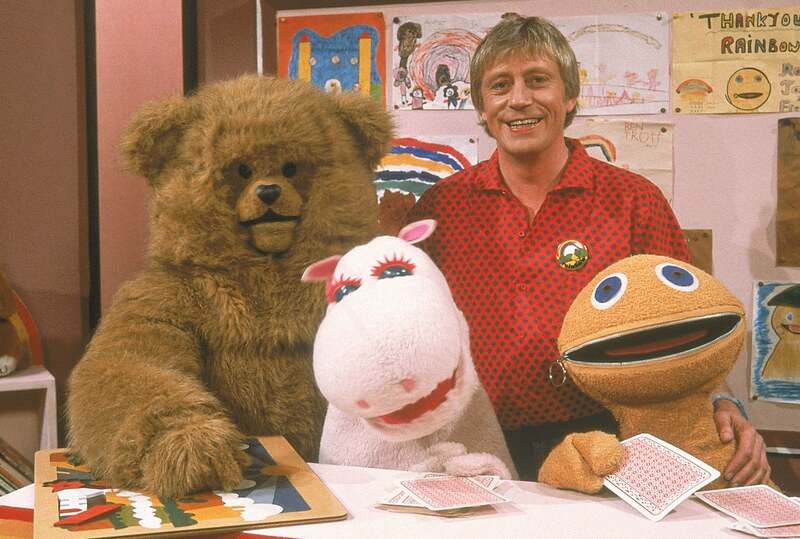 Were the Rainbow Flag unfurled this frequently to celebrate the immense cultural impact of Geoffrey, Bungle, George and Zippy, I would be the first to salute it. Instead, the four occasions are: the start of LGBT History Month; International Day against Homophobia, Biophobia and Transphobia, and Pride days in each of Edinburgh and Glasgow. In the unlikely event that any TCW reader has not yet memorised each of these momentous dates, fear not: as a prompt to display due deference when the time comes, from all its buildings the SNP Government will fly a multi-coloured reminder. Just don’t expect to see a Union Flag alongside it.